After standing in the Barry M aisle in Boots for what seemed like forever, I decided on the Barry M Lip Paint in Flamingo Peach (161). I've been on the hunt for a lip stick that suits me for ages, and I have decided 2013 is the year I'm going to find it. Flamingo Peach is a really pretty peach colour with a slight shimmer which will look so pretty when spring/summer finally rolls around. The lip paints also really moisturising which is perfect for me as I have huge trouble with having chapped lips, which is another reason I've been too scared to try lipsticks so far! When I say I've tried pretty much every lip balm out there I am not joking. 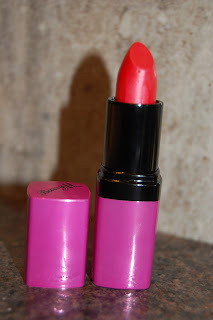 I've heard great things about the Barry M Lip Paints so decided they'd be a good bet to begin with. I would definitely recommend them for lipstick virgins like me and also those of you who are just looking for a new colour. They're only £4.49 from Boots (plus I got points on my card, bonus!) which I think is a great price for what you get. P.S. Just as I was thinking that I may have finally found a colour that suits me, my Mum walks into my room and says "Oh god Bethan I really don't like that lipstick!". Thanks Mum. I found your blog when I was googling reviews of this lipstick and I'm glad I did, now following you :) I'm undecided between this one and Coral Blush. Hello! I'm Bethan, currently documenting the little things keeping me sane during a quarter life crisis.